On the 22nd of September 2018, Morgan gave birth to a female calf. This was despite the ban on breeding by SeaWorld (who owned all the orca at the time of conception) and despite the fact that her EU Certificate did not permit breeding (i.e., that she could only be used for research). 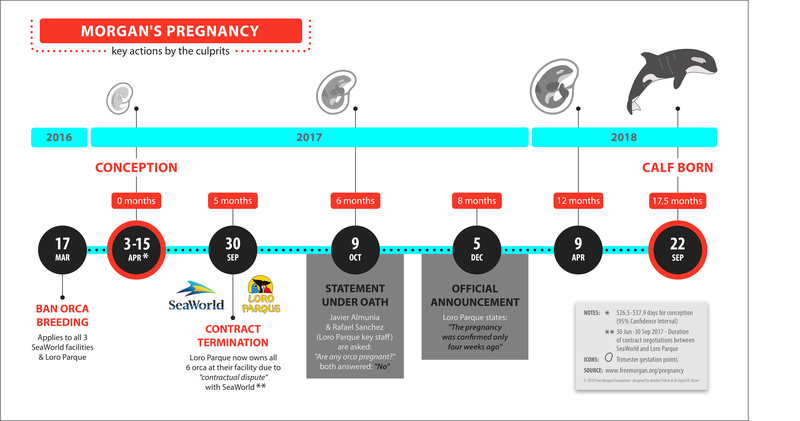 This infographic outlines the key actions by the culprits during her pregnancy. More details are given on the Pregnancy Timeline page and the details regarding conception, detection of pregnancies and gestation are on the Pregnancy Details page.